During these winter days in dinner we tend to lean over to some hot oily food when the temperature hovers near about 10o C. A traditional dish "mete chorchori" [liver curry] is one of the best recipe for the busy weekdays when you do not want to spend much time in cooking nor buying junk meals. One try can fetch you to the kitchen every time, I bet. 1. Boil liver pieces in one cup water until cooked well with one bay leaves, 1 tsp ginger garlic paste, slight turmeric power and whole pepper corn, keep aside. 2. Blanch the tomatoes in hot water then in cold water, peel off and make a paste. 3. In a pan heat oil, add whole spices, add sugar then onion slices and potatoes, fry until golden in color, add ginger garlic paste, add tomato paste and fry well until oil oozes out. Add boiled liver, [do not add the boiled juice here], add masala powder and vinegar, stir oil, add salt. Now add boiled liver juice and let it cook in simmer. After a few minutes when oil oozes out put off the flame. 4. Add spring onion and chili, serve with hot bread, nun or paratha. 5. 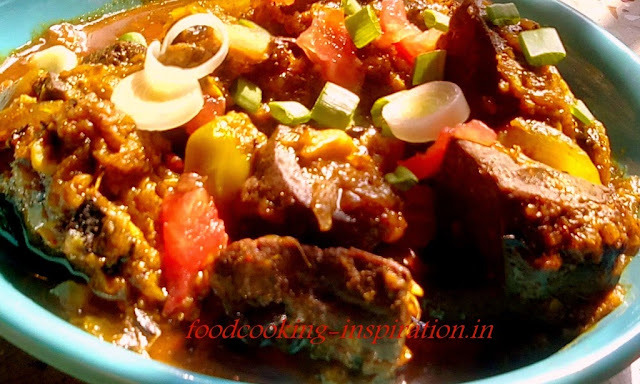 In this recipe Bengali people like to add different winter vegetables for different taste variations like peas, carrots, beet roots, turnips, brinjal etc.